The Ukulele are musical instruments that originate from Portugal and may have four strings, six strings or eight strings. Developed in the 19th century, you can play this instrument using the uncovered thumb, fingertips or felt pick. This instrument’s volume and tone vary depending on its construction and size. Its most common sizes include the soprano, concert, tenor, and baritone. Beginners usually start learning the ukulele with the soprano or concert sizes in order to be better accustomed to the true traditional sound of the ukulele. These sizes are smaller, very easy to play, and cheaper than the other ukulele sizes. If you listen to and enjoy the traditional ukulele sound, it is most likely in your memory and you will be able to form the chords easily. However, some models of tenor-sized ukuleles are suitable for some beginners, especially those with larger hands. This is because tenor ukuleles have well-spaced frets. Ukuleles are very lovely, easy to learn instruments that are fun to play and listen to. They come in different shapes and sizes. The size of your ukulele is a major determinant of the kind of sound you will get when you play. Since ukuleles are quite easy to learn and play, many children and adults alike love playing them. It is important to take this into consideration when choosing the best ukulele for yourself or anyone else. 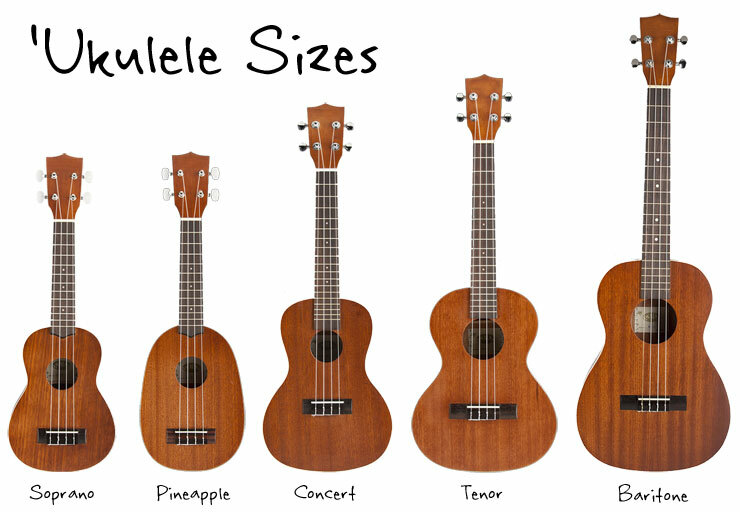 The ukulele sizes fit into four categories. Soprano Ukulele – This was the original ukulele and the smallest of all the sizes. It is the best option for children with its 13-inch scale length and an overall length of about 21 inches. Moreover, its sound is usually bright and sounds very much like a ukulele. Concert Ukulele – This ukulele is slightly bigger than the soprano ukulele with its 15-inch scale length. It also has an overall length measuring about 23 inches. Furthermore, it sounds slightly like a soprano but with an output that is louder and deeper. Tenor Ukulele – This ukulele has widely-spaced frets and is suitable for people with larger hands. It has a scale of about 17 inches and an overall length of about 26 inches. The sound it produces is deeper and more resonant than both soprano and concert ukuleles. Baritone Ukulele – This ukulele produces very deep bass notes than the other three ukuleles. This is because of its scale length of 19 inches and its 30-inch overall length. Moreover, the first four guitar strings make this size a favorite for guitarists who want to try out this fun instrument. A ukulele is a fun instrument with many parts. Knowing the parts of this musical instrument is one of the first things you need to do as a beginner. It will help you better understand it. Without knowing the parts of your ukulele, it will be hard to understand the manuals, reviews or tutorials that you will encounter before and after buying your best ukulele. Some of the major parts of the ukulele are below. Body – This is made up of the top or soundboard, back, and sides which are from different materials. 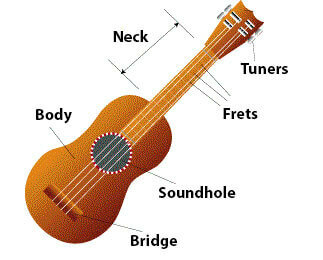 The primary purpose of the top is to transmit the vibrations of the string across the length of the ukulele. Furthermore, it has a sound hole and is usually beautified with a rosette that projects the sound output of the ukulele. Bridge – This part stands on top of the ukulele. Its purpose is to securely hold the saddle. Additionally, the strings are knotted at the bridge’s tail end to hold them firmly. As a result, this prevents them from snapping. Fretboard – This is also known as a fingerboard and mainly holds the frets firmly in place. It usually has images or marker dots to help position the player. Different types of ukuleles have a different number of frets that space differently. The bigger the ukulele size, the wider the spacing between the frets. Head or Headstock – This is attached to the neck of the ukulele and its main purpose is to firmly grip the tuners or tuning pegs. Neck – This covers the part from the head or headstock all the way to the body. As a result, it mainly serves to support the fretboard. Nut – This part goes in collaboration with the saddle to correctly align the strings. Tuners – These are also called tuning heads, tuning pegs, tuning machines, or tuning keys. These mechanisms help to hold the strings. Furthermore, you have to turn them in order to adjust the tension on the string during tuning of the ukulele. A ukulele is an addictive and fun musical instrument. Your ukulele cannot do without some basic accessories. When shopping for the best ukulele for beginners, you should also set aside money for its accessories. There are very good brands that actually include some high-quality additions. Electric Tuner – This accessory has the sole purpose of easing the tuning process of your ukulele. Some brands offer this accessory for free, while some advise you to buy it separately. Most times, these tuners have a mode that easily matches the ukulele strings. Felt Pick – This accessory is for ukulele players who do not like using their fingers, and players who like the different sounds. In some cases, however, felt picks are used when the strings are too rough and injuring the player. Picks are very affordable and the player can carve it. Strings – This accessory is a must-have for every ukulele player. Strings go a very long way in determining the quality of sound produced by your ukulele and its playability. There is a variety of string types that produce different sounds to meet individual players’ needs. In some cases, the strings that come with the instrument are perfect. However, strings do not last forever and you will have to replace them from time to time. Therefore, it is important to have high-quality spare strings that will give you the perfect sound without requiring frequent replacement. Choosing a ukulele has a lot to do with getting one that works best for you. It should give you the kind of sound that delights you while also being fun to play. 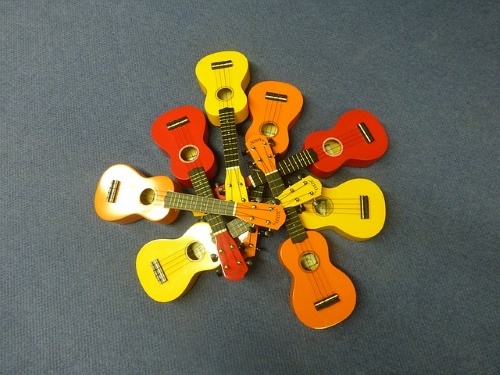 Most beginners or first-time buyers of ukulele struggle with the problem of having too many choices. Furthermore, choosing one ukulele out of thousands can be very tasking, and making the wrong choice is usually a heartbreaking experience. For this reason, here are some basic factors to take into consideration when choosing the best ukulele for beginners. Price/Budget – When choosing the best ukulele, buy one that is within your budget, preferably above $25. Although there are some very good ukuleles that will be worth spending some extra money to get, beginners should start with cheaper ones. Cheap, however, should not mean low quality. 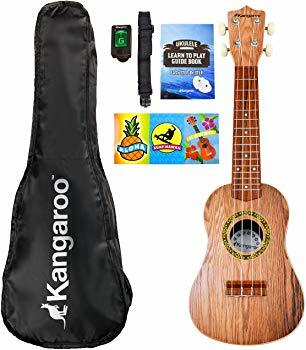 If you want to get a ukulele and not a toy, take your time and choose an affordable ukulele that has a lot of useful features to offer. You can upgrade later. Size – The best ukulele for beginners should be either soprano or concert. In some cases, however, you can use tenor size ukuleles. For children, the soprano is the best choice you can make. Concert size ukuleles are the favorites for adults. Furthermore, these different sizes of ukulele tune and play in the same way. The difference is the tone, playability and fret spacing. Construction – An ukulele should not be overbuilt but it should have a light construction so that it will sing better. Overbuilt ukuleles most often will not sing. For the tone of a ukulele to be beautiful, powerful, well-projected, and easy to play, it needs to be lightly constructed. The light construction of this instrument will also make it relax better in your hands. Balance – The best ukulele for beginners should be well balanced from the top to bottom. Also, the neck and head should not be too heavy to avoid throwing off the sound of the ukulele. Sound – When you strike the strings of the ukulele you intend to purchase, it should give off a good tone and not some buzzing noise. Moreover, the best ukulele for beginners should have a long sustain. It should also have an even projection through the notes to produce a full sound, without dropping suddenly. Playability – Ukuleles are instruments that are generally quite easy to play. Factors such as action, frets, size, and string go a long way in determining the playability of your ukulele. Most beginner ukuleles come playable with little or no need to change the materials. Function – Before you buy that beautiful ukulele, consider what purpose you need it for. Do you need it for beach hangouts, studio recording, stage performance, or display? If you can decide what exactly you want this instrument to do for you, you will have a better idea of what to look out for. Outdoor Ukulele – Some ukuleles are of material like wood. This means it does not last long when under harsh conditions. Only the sturdiest ukuleles can withstand extreme weather conditions because they are of a material that is waterproof. Indoor Ukulele – This ukulele should be loud. People usually play the indoor ukuleles in the sitting room, studio, stage and anywhere that it would have a room without being a nuisance. Appearance -Looks can be deceiving. Be wary of ukuleles that look great but sound horrible. It is better to get a simple-looking ukulele with great features that enhance the sound. Moreover, the ukulele should make it playable than to get a well-designed one that has nothing else to offer. With the growing interest in ukuleles, it is becoming increasingly easier to get resources on how best to learn to play your ukulele. You can get these helpful resources online or offline. Although the ukulele is a fairly easy musical instrument to learn, you will still require some coaching to make it easier for you to master it. Practice How to Properly Hold Your Ukulele – When you get your ukulele, hold it in different positions. Take time to practice how to hold your ukulele while sitting and standing. Try not to hold your ukulele too tight so that the instrument will have room to vibrate. 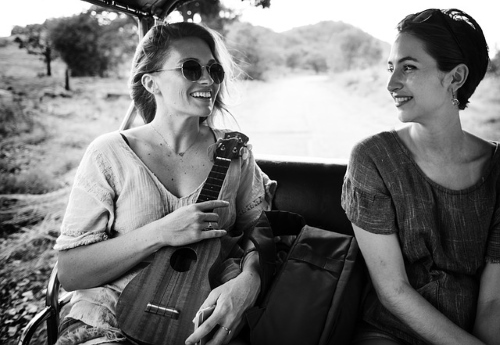 Get an Experienced Ukulele Player – A experienced ukulele player, who is can be your ukulele teacher or coach can guide you through the process of learning how to play. The main advantage of this coach is to have someone you can easily share every challenge or breakthrough with. More so, your teacher will be sure to motivate you when you need it – especially if you get discouraged or lazy. Get Instructional Guides – Some ukuleles have instructions for step by step guideline on what your ukulele is all about and how best to learn to play it. These instructional guides usually accompany beginner ukuleles. Furthermore, they are quite easy to understand. However, you can always buy one for yourself if you feel you need it. Its main advantage is that you can learn in your free time. Whenever you have some time to spare, you can pick up your ukulele’s instructional guide and practice. Get Songbooks – Songbooks are also important resources that sometimes come with a ukulele bundle or kit. There are many song books that contain popular songs you can play with your ukulele. These songbooks usually contain favorite rock, folk, country, blues, and pop songs adapting to your ukulele. Furthermore, they may contain lessons for beginners and tutorials for advanced players. Watch Online Videos – There are many videos, usually on YouTube, that can guide you. Some of these videos are free while some require a subscription. 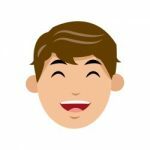 If you have a schedule you do not want to fix a coach into, or you are just learning the ukulele for fun, this resource is best for you. You can play along with the online tutor, pause the video if need be, and download it. For left-handed players, this resource is one of the best options as you can easily mirror the player. Before buying a ukulele as a beginner, it is important to know your personal preference in regards to your style of play and budget. Ukuleles are lovely instruments that can be quite confusing to choose from. Make sure your decision revolves around these reviews. This will assure you that you have made a worthy investment. This concert ukulele has its top, back, sides and neck made from sapele/mahogany. The fingerboard is of rosewood. It also has 4 Aquila strings with 2 strap buttons installed. There is a beautiful ABS binding across the body and neck. It also gives a very rich sound. To guarantee that this early starter ukulele stays in tune, this ukulele integrates chrome die-cast tuning gears. Furthermore, the LU-C sounds great. This soprano ukulele has a mahogany neck with a rosewood fingerboard that holds the Kauri top and composite back and sides together. It also features 4 Aquila super nylgut strings to ensure you enjoy very good sound quality. Moreover, the bridge of this classic ukulele is like a dolphin, while the nuts and saddle are of plastic material. A nice glossy finish perfects the look of this ukulele and a carry bag of nylon is included to protect your instrument. As a result. this musical instrument is the best choice for beginners as it comes in different colors, is budget-friendly, and easy enough to play. This ukulele comes highly recommended for its super cute looks and impressive sound. This is a great way to get introduce someone else to ukuleles. Makala Dolphin is undoubtedly the best ukulele under $50. This soprano ukulele has its body and neck made from mahogany. Its bridge is from rosewood. The rosewood fingerboard has 12 frets from brass. Also, the fret positions are marked at the 5th, 7th and 10th frets on the fingerboard’s neck and top. Furthermore, the satin finish gives this beautiful piece a smooth and exquisite look. This early starter ukulele comes already strung with 4 Premium Aquila Nylgut strings held securely by geared tuners. Moreover, this top-notch ukulele is inexpensive, lightweight and suitable for younger children. This ukulele stands out from others by giving the beginner everything they need. This cute little instrument is the best bang for your buck. Moreover, it is undoubtedly the best ukulele to start with. This concert ukulele has a mahogany body and neck that produces a very full and rich sound. It is very comfortable as the rosewood fingerboard has 18 brass frets, and bridge. One unique feature this ukulele has is a tuning machine for keeping your instrument in place. The ukulele also makes use of very soft and smooth carbon nylon strings to produce a sound with both clarity and sweetness. 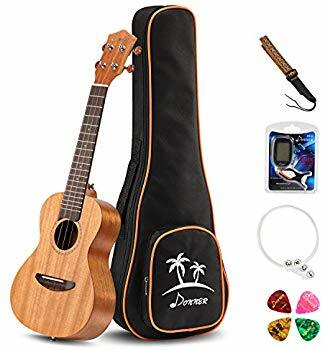 Accessories inside are a ukulele case, a carbon nylon string, a colored strap, and an accurate tuner DT-2 Donner with battery. This ukulele is soft on the eyes and pleasant to the ears. When you get this ukulele, you will enjoy its sound and feel at a very affordable price. Therefore, pick one and spread great vibrations. This soprano ukulele has a body of Nato and a fingerboard of rosewood material to produce a sound that is both warm and sweet. Its construction is sturdy and will last a long time. More so, this ukulele has 4 light nylon strings, 12 frets, and a fixed bridge system to ensure excellent sound quality. Easy to play, beautiful and quite light, you can also carry this ukulele with you anywhere. As an assurance of quality, this fun instrument has a limited lifetime warranty. This tenor ukulele has a mahogany body and neck, complemented with a rosewood fingerboard and bridge. The beautiful instrument has white binding placed on its top and back to accent the rich satin finish made of mahogany. Furthermore, this 4 stringed instrument made of Nylgut material and a light string gauge will give it a natural sound. Additionally, the tone of this ukulele is full-bodied and produces a very full and rich sound. 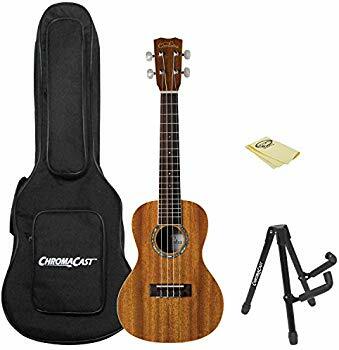 It has an active shadow NANO-FLEX Eq system that is lightweight, and chrome die-cast tuners to keep your ukulele in tune. This pleasurable ukulele looks great and is quite easy to play. For an instrument of this price range, it has a very good sound. There is no disappointment with this early starter ukulele. This concert ukulele has its top, back, sides and neck made of mahogany. It also has a rosewood bridge with a fingerboard having 18 frets. The makers use Ivoroid for the binding and an avalone rosette adds to the beauty of this ukulele. To crown it all up, matte satin gives it a nice cool finish. Furthermore, the instrument has 6 beautiful strings, is handmade, and sound great. In this package, there are a gig bag cast by chrome, a stand, and a polish cloth. This 6-stringed ukulele for starters is of quality materials and is durable. It also produces fantastic sound and is a joy to play with. Thus, this is definitely a great package at a great price. This tenor ukulele has a mahogany body and a clean satin finish. It is especially for beginners, especially those with larger hands, who consider the concert size too small. This handmade ukulele gives a beautiful warm tone and a sound that is clear, rich and full. Some of its distinctive features include a beautiful silver tuner adorned with pearl buttons and 4 Deluxe Aquila strings. This is a much-loved ukulele because it is absolutely easy to play and looks very cute. Many reviewers enjoy this item. It makes the player feel fresh whenever they hold and play it. The quality of this ukulele goes far beyond its price. This soprano ukulele has a mahogany body and bridge. As a quality starter kit, it gifts the beginner with a pitch pipe, a quality gig bag, tuning instructions and a chord guide. Moreover, it has a beautifully shaped neck. This outstanding ukulele gives you excellent sound output, tone quality, and durability. Furthermore, this lightweight musical instrument is also a great travel companion. Most of the reviewers recommend this outstanding product as one that is well worth the price. It gives an outstanding sound, tone, and action. It is also great for outdoor use, as you can take this cute little instrument everywhere you go. This soprano ukulele is of faux wood and special plastic materials. It is very easy to learn. 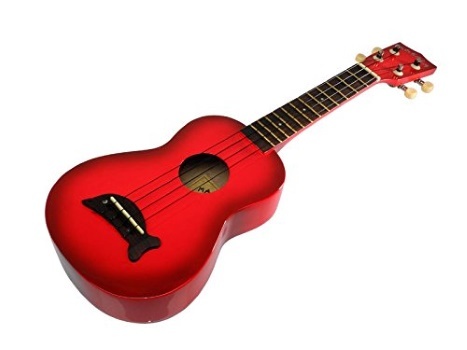 This starter ukulele is suitable for ages 3 and above. It also features good quality plastic strings. The product includes a 46-page step by step instruction book. It has songs for practice, 2 picks, a good quality gig bag, electric tuners (with batteries) and a strap. This ukulele has perfectly spaced frets and strings. Thus, this makes it suitable for children’s smaller hands. Conclusively, this is one beautiful musical instrument that sounds very well and is a favorite gift item for children who are aspiring to be musical prodigies. 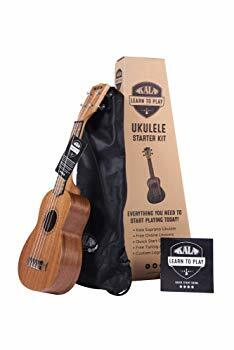 This ukulele starter kit comes with every accessory a beginner or a complete music novice needs to become a ukulele music star. This item is suitable for ages 3 and up. Furthermore, it teaches you how to play the ukulele like a pro. It also gives you the classic ukulele sound. In summary, ukuleles are fun musical instruments to play. They are quite easy to handle, easy to learn, affordable, and have a very nice merry sound. If you want to learn to play a musical instrument, the ukulele is the best instrument to choose. It does not require much effort to sound good. Moreover, it also does not require too much formal training. 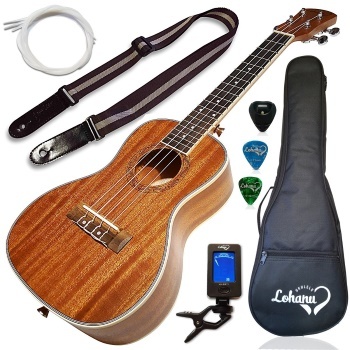 Therefore, the items above should include at least one ukulele that will be perfect for you.